A Boston Food Diary: News Alert! Where To Eat celebrates 10 years!! News Alert! Where To Eat celebrates 10 years!! Aren't anniversaries wonderful things? Time to reflect back on where you've been, celebrate your progress and plan for the future! 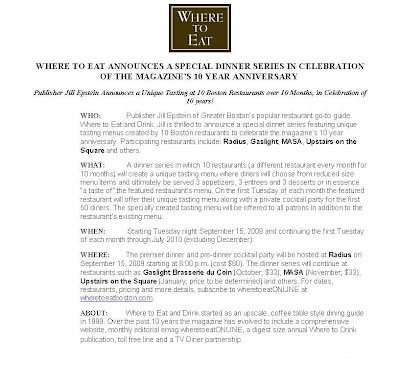 Well just 10 short years ago Where To Eat, a magazine publication throughout greater Boston, started their journey of showcasing the hot restaurants around the area we should all be checking out. After a decade of hard work- now its time to celebrate! How are they going to rock out their big day? By inviting their readers, or even just those people who love to eat, to check out 10 different restaurants over the next 10 months. Each restaurant participating in the dinner series will create special tasting menus to offer those in attendance- and each restaurant will offer a private cocktail party to the first 50 diners who sign up! These events will take place on the first Tuesday of each month, from September 15, 2009 (ok- so the first Tuesday starting in October) and continuing til July 2010- they are taking off December 2009. Most of the restaurants are offering these special menus of an appetizer, entree and dessert at just $33.00-not a bad deal! More information below-hope to see you all there!